Lilke many roads in the city, Albany Road in Chorlton was beset by potholes and was due to have fresh tarmac laid down. All residents in the street were leafleted but council workmen had to abandon the job half done because of cars which had been left parked - and even a skip left blocking the road. As our pictures show, the road is now completely smooth on one side and worse for wear on the other - making driving even more difficult than before the job was started. 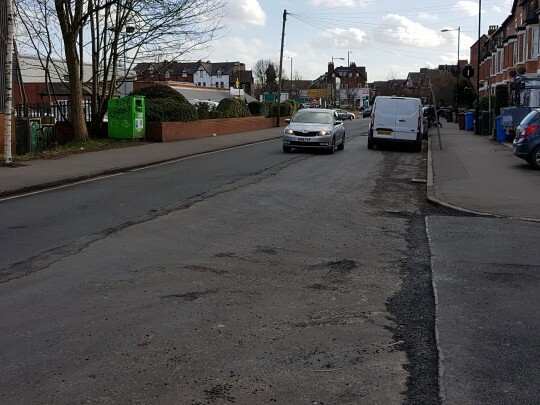 Albany Road resident Alan Lee said: “When the contractors came to re-lay that road, there were unfortunately about seven cars that they could not move. The J Hopkins contractors were on another job ripping up the road and that vehicle was moving those cars. "So, what happened is because they could not move it, they had to leave the road with it stripped on one side. I was absolutely livid because there were so many cars. “It’s a shame really because the lads were ready to go. “All the tarmac that they had ordered had to be shipped off to another place where they were working. It even caused problems for the guy doing the lane writing. They were ready to go, so when it came to 12 o’clock, they had to go off and they were a bit cheesed off. “But as a resident, I am a bit of a busy body and I see what goes on quite a lot. There was enough paperwork that went on cars and every household had it done, but there was one certain car that had that piece of paper on the passenger seat in the car. It’s frustrating!" Chris Nettles, from Manchester City Council highways department, said resurfacing to finish the rest of the road was now planned for next week. “Everyone is going to get another letter dropped. The cars will have letters posted on them, as well as for people that live around the area and leave cars there and don’t pick up from letterboxes. "We also have the lifting crew and they will get there before we finished the matte off,” he said.